Brooklyn style and fake bacon in Chinatown. The vegan Supremo, with faux sausage, bacon, and pepperoni. At a certain point, Viet Nguyen realized he was working more on his pizza dough than his master’s degree. He made pizza every day for two years. Eventually, he went on to teach Asian American studies part-time at a community college in San Jose. But his side hustle? Mobile wood-fired pizza. That was the beginning of Bare Knuckle Pizza. After five years of farmers’ markets and catering gigs, Nguyen opened his first brick-and-mortar in January. The tiny counter-service joint sits in Oakland’s Chinatown with a handful of bar seats, some outdoor tables, and a dark upstairs that very much feels like it used to be meant for storage. More importantly, it has two nearly identical menus: one for meat-eaters and one for vegans. I’ve never seen such an impressive selection of vegan pizzas anywhere. While most restaurants cater to vegans with a single pie — or offer to swap out mozzarella for vegan cheese — Bare Knuckle sources vegan alternatives for every single ingredient. That means vegan pepperoni, vegan sausage, vegan bleu cheese, and vegan bacon, in addition to the now customary vegan mozzarella. And what vegan mozzarella! Nguyen gets his vegan products from a few different sources, but the mozzarella comes from The Butcher’s Son in Berkeley. It melts, something once unheard of for vegan cheese, and tastes positively creamy. It gets better: Unlike other East Bay pizza shops, Bare Knuckle’s vegan pies cost exactly the same as their meat counterparts. This is a vegan tax-free establishment. No wonder Nguyen estimates as much as 40 percent of his business is vegan. Nguyen himself is a vegetarian, vegan-sympathizer, and champion of fake meats. More importantly, he’s infectiously passionate about pizza. Before he started perfecting his own dough recipe, he took regular pilgrimages to New York to hit all the famous pizzerias. (And visit his wife.) Originally from a small town in Indiana, Nguyen had never experienced the glories of wood-fired pies before. He specifically fell in love with the Brooklyn style of Neapolitan pizza: individual-sized, thin-crust whole pies cooked in a blazing hot oven until crisped on the edges, with extra points for top-quality ingredients and inventiveness. Nguyen cited Grimaldi’s, Lucali’s, and Paulie Gee’s as his main inspirations. 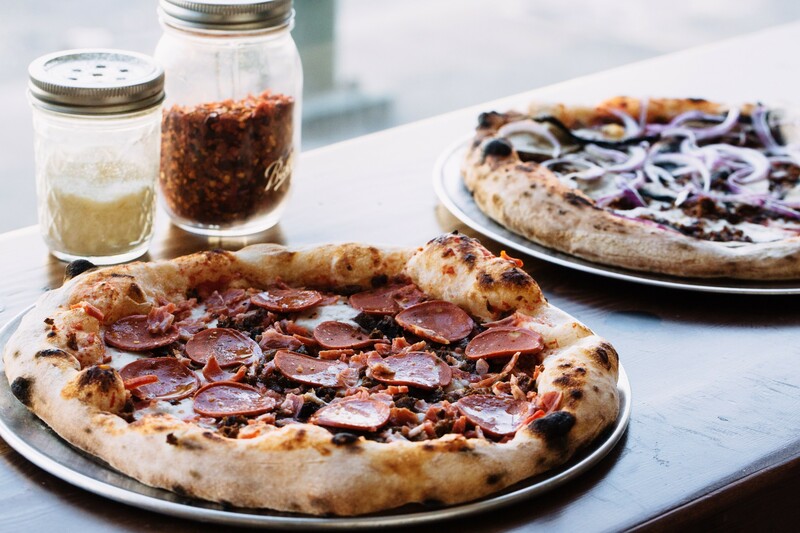 I suspect his pies at Bare Knuckle don’t quite reach the nirvana of these Brooklyn destinations, but the crust ranks among the top-tier of East Bay pizza spots. It’s beautifully blistered, pillowy yet chewy, and full of flavor — I could snack on these crusts all day. Nguyen is tight-lipped about his dough, only willing to reveal that he uses the traditional, extra-fine “00” flour. “My wife has asked me about this recipe and I’ve never spilled the beans,” he said. He is willing to talk about his oven, though: a custom-built beauty from Forno Bravo in Salinas. Fed with almond wood, it can reach 1,000 degrees, making it quite possibly the hottest oven in town. 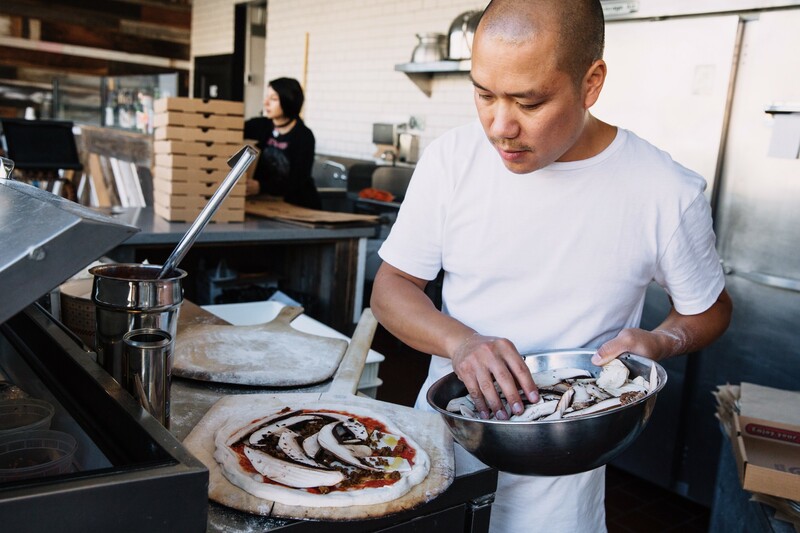 Viet Nguyen is living his pizza-making dream. Whether you should go to Bare Knuckle or Lucia’s or Pizzaiolo or another one of the East Bay’s Neapolitan hubs tonight is going to be a matter of personal preference. It’s also worth keeping in mind that the aforementioned restaurants offer very different environments. While Lucia’s and Pizzaiolo cover the date-night-to-special-occasion spectrum, Bare Knuckle is laid-back, less expensive, and all about the pizza. You can’t order a side salad or finish with dessert, but you can pair your pie with a can of PBR. My favorite Bare Knuckle pie is actually Nguyen’s homage to a beloved pizza at Brooklyn’s Paulie Gee’s. It arrives glistening with honey, and layered with dried cherries, prosciutto, gorgonzola, and mozzarella, and thrives on the interplay of sweet and salty with a touch of funk. Generally, Nguyen’s other combinations are more straightforward, but the ingredients are top-notch. He tries to source locally, but some products come from farther afield. The prosciutto is from Italy, for example, and the pepperoni from New York. That pepperoni pie, by the way, was excellent. So was the TKO, which sees portobellos gently drizzled with truffle oil. It was also the firmest pie I received, easy to pick up and fold in half like a New York slice. I suspect that’s because the TKO came sauce-less. The pies with red sauce all arrived slightly soggy in the center, as is usually the case with the Neapolitan style. The greatest offender was the margherita — the only pizza I couldn’t pick up at all. But looking around on a busy Wednesday night, when margheritas go for a discounted $10, that level of extreme wetness didn’t seem to be everyone’s experience. I was more impressed by the vegan, gluten-free margherita — partially because I wasn’t expecting much. Again, the vegan mozzarella proved its worth, and Nguyen’s bright, not-too-sweet tomato sauce shined. The gluten-free crust held its form, avoiding the common crumbly-while-also-somehow-mushy pitfall of so many gluten-free doughs. It does necessitate a $3.50 surcharge and comes from Venice Baking Company, though Nguyen is toying with the idea of creating with his own gluten-free recipe in the future. While most of the menu is fixed, Nguyen usually throws in a couple of seasonal specials. Right now, there’s a sturdy, sauce-less pie topped with peaches, prosciutto, and a pile of fresh arugula. There’s sort of a secret menu, too: any pie can be made into a calzone at no extra cost. Unfortunately, I found out too late for this review, but I plan to remedy the situation soon. Eating through Nguyen’s pies, I found myself wishing there was slightly more variety in the vegetarian department. Yes, there are loads for vegans, but there are only two options for those wanting real cheese but no meat — fake or otherwise. Brussels sprouts, squash, sweet peppers — Nguyen said that’s just not his style. Still, I admire his conviction. It matches Bare Knuckle’s more rock ’n’ roll vibe. It feels more Brooklyn.